October 30, 2018: The timepiece has been named after the Italian city of Florence. Culturally rich and diverse, Florence is known as the ‘cradle of Renaissance’. Painted by the imagination of Michelangelo and strewed with extraordinary architecture at every turn, the city serves as the perfect backdrop for the Firenze timepiece. A story of revival, renewal and rediscovery, AIGNER Firenze is inspired and named after the beautiful Italian city of Florence. From bezel to buckle, the limited edition timepiece resonates with the artistic strokes of medieval brilliance. In essence, the timepiece is the metaphorical transition of AIGNER’s craft of time keeping. 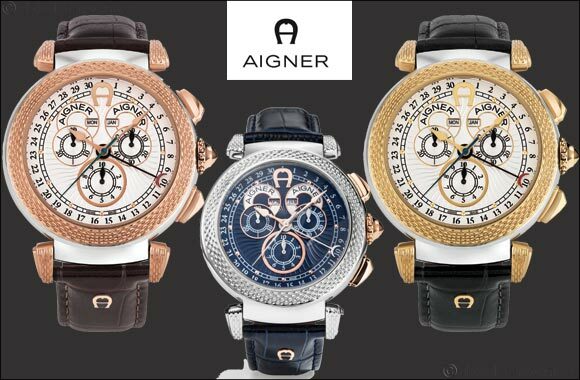 The chronograph, extends beyond the realms of the unmistakable AIGNER horseshoe to take the shape of a conspicuous round dial; the reminiscence of the Italian antiquity in the design are symbolic of the awakening and evolution of the brand and its patrons. Like the Florence Uffizi Gallery that holds priceless collection of Renaissance art, the timepiece is reinforced by an opulent bezel with matching crown and pushers. The calendar, date anchor and exquisitely fashioned hour hands along with the three counters are placed on an effusive wave backdrop to give birth to a stunning, masculine timepiece that covets the attention of admirable men of fashion everywhere. Available in a limited 199 pieces, AIGNER Firenze is the passage of time measured and reflected through the superior craftsmanship of AIGNER.